LOS ANGELES – Given all that we love about Downtown LA, what would we suggest if you only had one day to spend in Downtown? 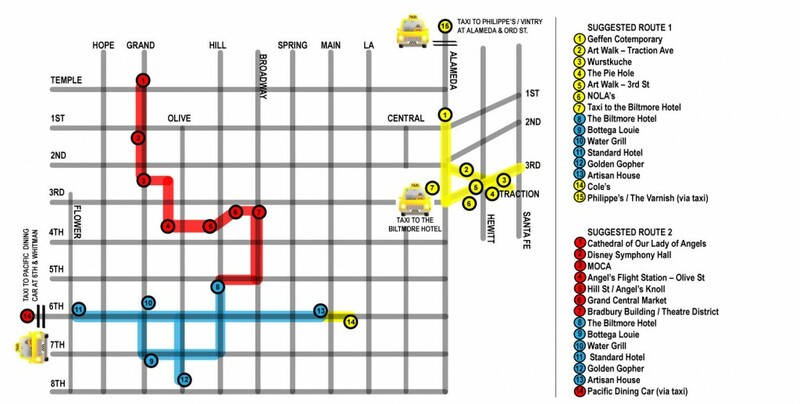 If you’re into the arts, we would suggest starting the afternoon with an art crawl (Route #1). Begin at MOCA’s Geffen Contemporary in Little Tokyo and check out their latest show, then walk a few blocks south to the LA Arts District for a bit of gallery hopping and the latest in LA street art. Refreshments or snacks can be had at Wurstkuche, Urth Caffe, NOLA’s or the Pie hole, which are all in the LA Arts District. Now that you’ve got your art fix, take a five-minute taxi ride or drive (be sure to park in a lot that allows overnights) to Pershing Square, which is smack dab in the center of Downtown and your jumping-off point for the evening. First stop: Biltmore Hotel. Head to the hotel’s Gallery Bar for pre-dinner cocktails (perhaps a perfectly mixed martini). Then it’s on to Bottega Louie (a couple of blocks away) for a light dinner (and definitely a macaron or two) and perhaps more cocktails. From there, assuming you, like us, have a penchant for alcohol it’s pub-crawl time; here’s your list: the rooftop bar at the Standard Hotel, the Golden Gopher, the Perch, the Water Grill, Artisan House. By now it’s late and you’ve closed down the bars……but don’t end the night without a visit to Cole’s or Philippe’s, both of which claim to be the original home of the French beef dip. Debates abound as to which is better, but it doesn’t matter – both are really tasty and are perfect for a late night snack. If you do opt for Cole’s, consider a nightcap at their backroom bar, The Varnish. Then it’s back to Biltmore Hotel, where you’re room awaits. Alternative Route #2: Art/architecture/history walking tour. Start your afternoon at the Cathedral of Our Lady of the Angels (on Grand and Temple) and check out the lovely work of Pritzker Prize winning architect, José Rafael Moneo. From there walk south on Grand Ave to 1st Street where you’ll see Frank Gehry’s wonderful Disney Symphony Concert Hall. Continue down Grand Ave (and along the way, be sure to glimpse construction of the new Broad Museum designed by Diller Scofidio & Renfro), eventually stopping at the main branch of MOCA to take in their latest show. From MOCA it’s a five-minute walk to the Angel’s Flight station where you can ride the short cable railway (fare is $0.25) down to Hill Street. If you’re a fan of the film 500 Days of Summer, head into the small park (called Angel’s Knoll) next to the Angel’s Flight station. There you’ll find the famous bench (aka Tom Hansen’s bench) used by Joseph Gordon-Levitt’s character in the film. Otherwise, head directly across the street to the Grand Central Market – LA’s oldest – where you can sample, at your leisure, a myriad of fun food and drinks. Next begin a stroll down Broadway, the original center of the city, by exiting the market on the Broadway side (you entered on Hill Street side). Across the street to your left (at 3rd Street corner) is the famous Bradbury Building. Pop inside and take in its gorgeous movie-set like interiors (unfortunately, you’ll be limited to the lobby area). From there, proceed south down Broadway where you’ll find yourself surrounded by fabulous old movie palaces and classical style office buildings. Take a moment to ponder what this part of LA must have been like in its heyday. Continue down Broadway, turning right at 5th Street until you get to Pershing Square where you’ll find the Biltmore Hotel (along the way, be sure to check out the US Bank skyscraper, California’s tallest building). Once you’re at the hotel, head to their Gallery Bar for pre-dinner drinks and then proceed as in the previous suggested route; though instead of a late night French dip, consider going upscale and grabbing a cab to the Pacific Dining Car for a nice filet mignon or decadent eggs benedict – yum! Clearly stated! Just amazing! Your crafting manner is actually charming and in what way you been able the topic together with grace can be valued. I will be intrigued, I make bold you are an specialist on this concern. I am subscribing to your potential updates down the road.